After age 40, healthy adults can lose up to 8% of muscle every 10 years1,2,3,4. Ensure® Gold™ nutritional supplement improves strength in 8 weeks5. 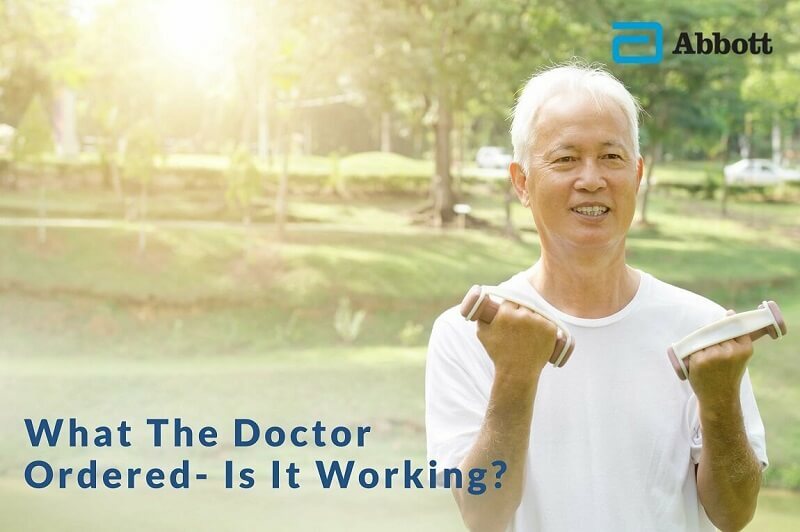 Here’s how to tell when it’s working —brought to you by Abbott Nutrition, putting science and innovation to work for more than 125 years. Having returned home from your light evening walk, you drink your second glass of nutritional milk supplement for the day. The delicious vanilla-flavored Ensure® Gold™ goes down in a matter of gulps; you smack your lips in satisfaction. Just what the doctor ordered. 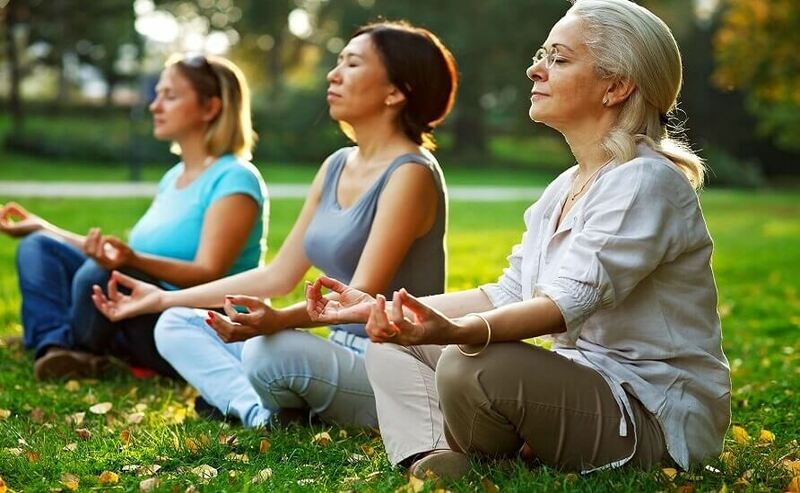 With each breath, your 50-year-old muscles become more relaxed and your neck and back are free of their usual aches. You realise with pride that you’ve been taking the supplement and leading a healthier lifestyle consistently for the last two months, since getting discharged from the hospital. And are you getting stronger? You wonder if this euphoria you feel is attributable to real health recovery, or just a temporary feeling that may be just an illusion. 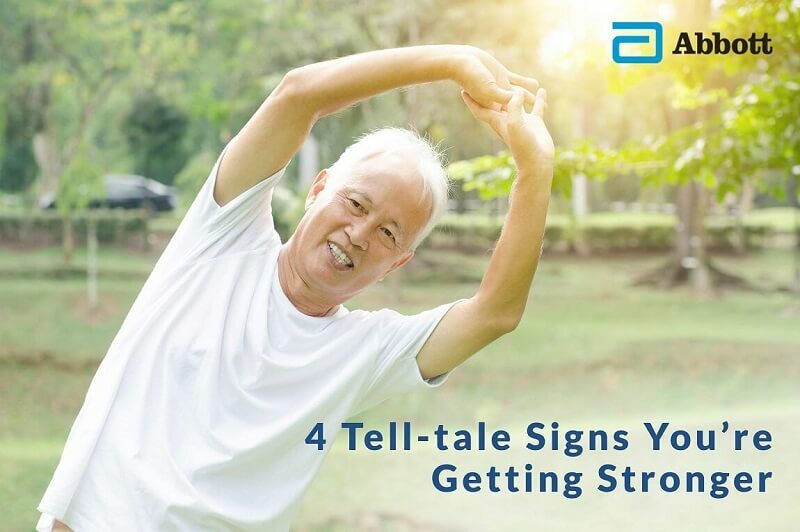 Worried about losing strength as you age? You may already be aware that healthy adults could start to lose up to 8% muscle mass every 10 years after age 40. But the loss of muscle mass is even more pronounced in inactive (bedridden), hospitalised patients. If you have been ill, or hospitalised for surgery, stressful demands and inflammations triggered on your body can lead the body to turn to muscle as a source of energy6. 10 days of hospitalisation can result in loss of muscle mass close to or even more than that lost by a healthy individual over 10 years7. Did you know, the more muscle mass is lost, the higher the risk of complications that may delay or complicate your recovery time post-hospitalisation? The science says that 10% muscle mass loss could impair immunity. 20% muscle mass loss could give you infections, thinning skin, decreased healing, and overall weakness. With 30% muscle mass loss, you could develop pneumonia and/or pressure sores, or be too weak to sit8. 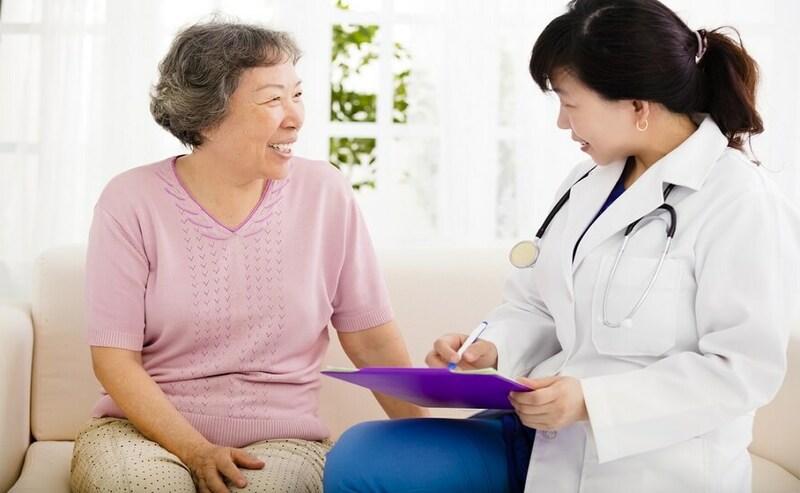 That’s why, if you’re an elderly patient who has just been hospitalised for major surgery, your doctor would have recommended Ensure® Gold™ as a nutritional supplement to you. Your doctor will tell you to consume it twice a day and pair it with light exercise. Ensure® Gold™ is specifically-designed to protect and build muscle mass to strengthen your muscle quality and immunity. New and improved Ensure® Gold™ has a unique combination of HMB , helps support building of muscle tissues, and Triple Protein Blend, which provides sustained delivery of amino acids to support muscle synthesis10. Along with calcium, omega-3 and 28 vitamins and minerals, Ensure® Gold™ is scientifically proven complete nutrition to improve physical movement and provide you everything you need for everyday strength11. Stronger legs at 8 weeks: If you experience knee pain, lower quadriceps strength, or loss of muscles in your thigh areas, you may find simple things like lifting your legs, bending and straightening your knees, and moving your hips difficult 12 . Apart from walking, these muscles are important when you’re bearing any amount of weight or squatting 13 . 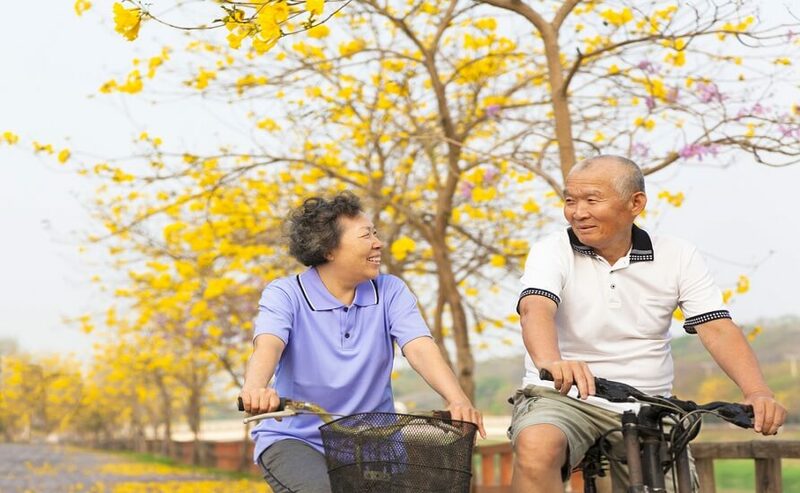 Studies show that elderly patients who drink Ensure ® Gold ™ have stronger legs after eight weeks and therefore have greater freedom of mobility 14 . 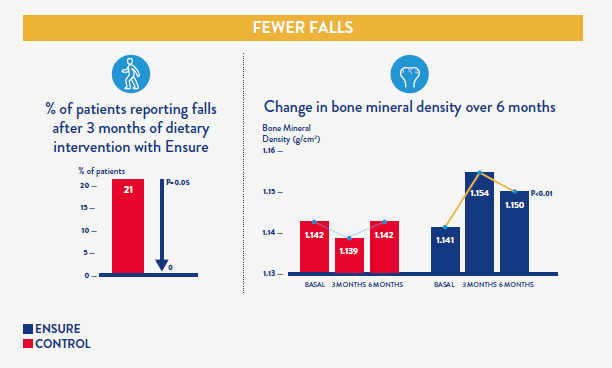 Improved walking distance at 8 weeks: With six-minute walking tests administered on Ensure and control groups of patients, it was demonstrated that you can see strength improvements from greater distance covered after 8 weeks of Ensure ® Gold ™15 . Walking is a simple day-to-day activity and this six-minute test shows you can have a greater capacity to endure exercise, which also means you are recovering faster 16 . Increased forearm muscle density at 8 weeks: Your forearm muscles (commonly known as extensors) allow you to extend and move your wrist and fingers. You activate them whenever you type a text message to your caretaker, carry groceries, grip the railing to go up and down the stairs, or hold your grandchild’s hand 17 .Measured with radial muscle density changes, it is shown that after 8 weeks of Ensure ® Gold ™ , you can have more strength to perform forearm manoeuvres as required by household errands, familial duties, or the pursuit of your hobbies, more independently 18 . Increased handgrip endurance at 8 weeks: On a daily basis, you push, pull, and pick up various objects using muscles, nerves and bones in your hand 19 . Grip strength is actually a key measure in the diagnosis of sarcopenia (muscle loss disease) and has been proposed as a useful marker of physical frailty and biological ageing 20 . 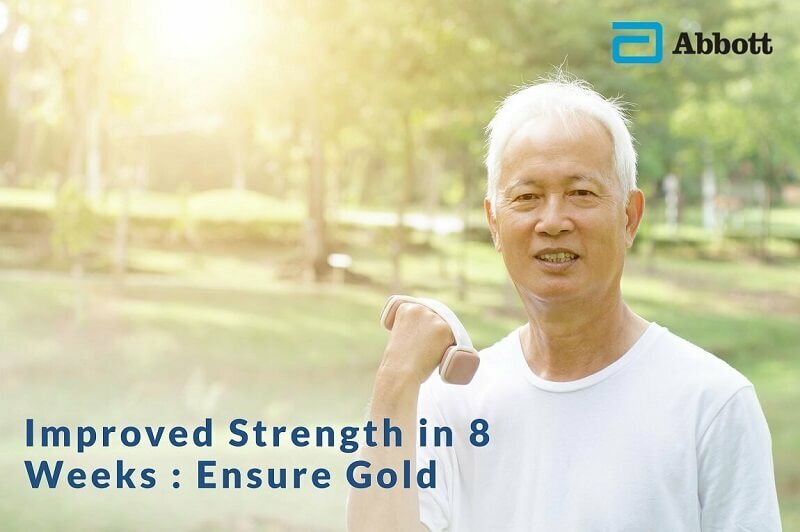 Elderly patients who drink Ensure ® Gold ™ for 8 weeks, coupled with light exercises, achieve up to a 25% improvement in handgrip endurance compared to those who don’t 21 . Age is inevitable. Aging isn't. Every day you return from your six minute walk-about the neighbourhood covering more and more ground. You breathe easy as you reach the gates of your house. You push the gate open with vigour and carry the trash out without any difficulty. A glance over at the garage makes you take out the hose to give your car a quick wash. Tasks that seemed so burdensome months ago now seem completely do-able. You realise that your legs are stronger, you are covering more distance, your forearm looks bigger, and your handgrip has improved. You haven’t fallen once. Satisfied with the strength gains you’ve made, you resolve to continue drinking Ensure® Gold™ and to keep up your newfound habits of exercising, sleeping well, and maintaining a healthy diet. 1 Grimby G, Saltin B.Clin Physiol . 1983;3:209-218. 2 Flakoll P, et al. Nutrition. 2004;20:445-451. 3 Baier S, et al. JPEN J Parenter Enteral Nutr. 2009;33:71-82. 4 Janssen I, et al. J Appl Physiol. 2000;89:81-88. 5 References: 1. Berton, et al. 2015. PLoS ONE 10(11):e01417757. doi:10.1371/journal.pone.0141757; 2. Cramer JT et al. J Am Med Dir Assoc. 2016 Nov 1;17(11):1044-1055. 6 1. Argilés HM, et al. JAMDA. 2016;17:789-796. 2. Xi P, et al. Frontiers in Bioscience. 2011;16:578-597. 3. Demling RH. ePlasty. 2009;9:65-94. 4. Wolfe RR. Am J Clin Nutr. 2006;84:475-82. 7 The study results were based on Lean Body Mass (LBM) measurements; LBM is made up of 75% muscle. References: 1. English KL et al. Curr Opin Clin Nutr Metab Care. 2010;13(1):34-39. 2. Kortebein P, et al. JAMA. 2007;297(16):1772-1774. 3. Paddon-Jones D, et al. J Clin Endocrin Metab. 2004;89(9):4351-8. 4. Paddon-Jones D, et al. J Clin Endocrin Metab. 2006;91(12):4836-4841. 5. Puthucheary ZA, et al. JAMA. 2013;310:1591-1600. 6. Deutz NE, et al. Clin Nutr. 2013 Oct;32(5):704-12. doi: 10.1016/j.cl- nu.2013.02.011. Epub 2013 Mar 4. 8 References: 1. Argilés HM, et al. JAMDA. 2016;17:789-796. 2. Demling RH. ePlasty. 2009;9:65-94. 10 References: 1. Argilés HM, et al. JAMDA. 2016;17:789-796. 2. Deutz NE et al. Clin Nutr. 2016 Feb;35(1):18-26. 3. Borack MS, et al. J Nutr. 2016;146:2468–75. 4. Cruz-Jentoft AJ. Curr Protein Pept Sci. 2017;18:1-5. 5. Abbott. Data on file. 11 (Note: when taken twice daily and consumed with exercise) References: 1. Berton, et al. 2015. PLoS ONE 10(11):e01417757. doi:10.1371/journal.pone.0141757; 2. Cramer JT et al. J Am Med Dir Assoc. 2016 Nov 1;17(11):1044-1055. 14 References: 1. Berton L, et al. PLoS One. 2015;10(11):DOI:10.1371/journal.pone.0141757. 15 References: 1. Berton L, et al. PLoS One. 2015;10(11):DOI:10.1371/journal.pone.0141757. 18 References: 1. Berton L, et al. PLoS One. 2015;10(11):DOI:10.1371/journal.pone.0141757. 21 References: 1. Berton L, et al. PLoS One. 2015;10(11):DOI:10.1371/journal.pone.0141757. Would you like to know more about our brand new Ensure® Gold™? Learn how you can achieve #StrengthForLife with scientifically proven complete nutrition. Here’s your chance to request for a free sample for you or your loved one. Ensure® Gold™ is scientifically formulated with HMB to increase your strength in 8 weeks. See strength improvement in 8 weeks! Save 20 RM; get 12% off when you buy 2*850g.